1. Light scattering (Rayleigh Scattering) is caused by imperfections in the fiber. It affects each wavelength differently and can be stated as 1/4λ. 2. Absorption of light energy due to the heating of ion impurities results in a dim­ming of light at the end of the fiber. 3. Microbend loss, due to small surface irregularities in the cladding, causes light to be reflected at angles where there is no further reflection. 4. 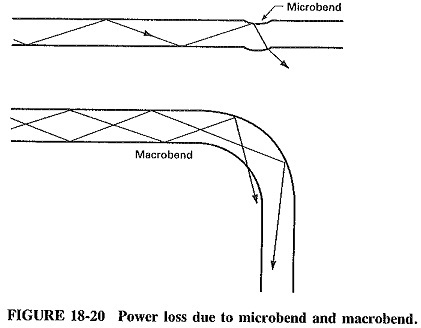 Macrobend is a bend in the entire cable which causes certain modes not to be reflected and therefore causes loss to the cladding (see Figure 18-20). 5. Attenuation is the loss of optical energy as it travels through the fiber. This Fiber Losses is measured in decibels per kilometer. The attenuation losses vary from 300 dB/km for inexpensive fiber to as low as 0.21 dB/km for high-quality single-mode fibers. Attenuation values also vary from one wavelength to another. In certain wave­lengths, almost no attenuation occurs; these wavelengths are called windows. Proper use of fibers as light transmitters requires an in-depth understanding of the fiber material being used. To ensure the most efficient use of a fiber, the light source must emit light in the low-loss regions of the fiber chosen.